In a country with low press freedom and media literacy, fake news could be a recipe for disaster. 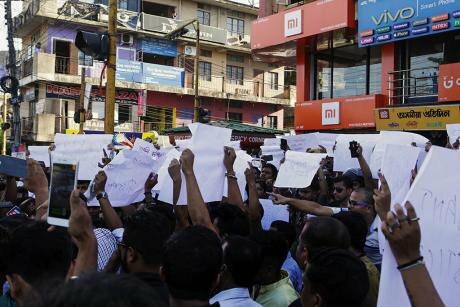 Protests over the death of two young men who were lynched because of rumours they were child lifters, 2018. Image: Dhruba Dutta/Zuma Press/PA ImagesIn his seminal book, Ignited Minds, former Indian president A. P. J Abdul Kalam wrote that for India, “the greatest danger to our sense of unity and our sense of purpose comes from ideologists who seek to divide the people.” While Kalam’s text was penned in 2002, the greatest threat to India’s plurality remains unchanged, and it persists in an era of disinformation and demagoguery. To validate the threat of disinformation, one only needs to review recent events where its effects have proved damaging. The list of nations assailed by disinformation is geographically diverse, and its forms vary from the manipulation of voter perception (Brexit, Catalonia, France, Kenya, US) to the fomenting of realised violence against ethnic groups (Myanmar, Sri Lanka). In the specific case of India, the detriments of disinformation pose an inexorable threat to pluralism. As a nation rife with ethnic, religious, and linguistic lines to exploit, the consequences of inadequately addressing the nation’s proliferation of “fake news” could very well be on display in the 2019 general elections. As made clear by recent elections and referendums, an under-informed base of users capable of amplifying disinformation at dizzying speeds could pose an existential threat to pluralism. As would be expected, some of India’s recent bouts with disinformation can be attributed to foreign adversaries, most notably Pakistan. False reports of 158 casualties suffered by India’s military during tensions in Doklam originated from a Pakistan-based news channel. Similarly, Pakistan’s government scrambled to dispute India’s surgical strikes following the Uri attack in 2016, an ambiguous event that even among India’s press garnered incredulity. Nevertheless, the threat from external actors has been limited. For the most part, the sources of disinformation in India originate from within the country. The recent state elections in Karnataka provided a glimpse into the disinformation apparatus of the ruling Bharatiya Janata Party (BJP). Using popular mediums such as WhatsApp, the BJP and its ideologically-aligned affiliates amplified false claims of expanding Islamic extremism. The use of closed-end messaging tools like WhatsApp has proved fruitful for those seeking to shield inflammatory headlines and bite-sized tidbits of faulty information from public scrutiny. Among the disseminated content were bogus reports of Hindu-Muslim clashes and a spurious BBC poll that showed the BJP pulling off a victory in Karnataka. The proliferation of fake news via WhatsApp in Karnataka is only example of a troubling trend that is evident in other parts of the country. While fake polls might appear innocuous, concocting the notion of looming sectarian strife is not. In instigating religious conflict, the BJP hopes to win over fence-sitters by exploiting the fears of Hindus. Such actions coincide with hopes that anxieties around ethnic identity can be mobilised to make Hindutva (Hindu Nationalism) politically palpable in Modi’s 2nd term. Equally salient to the disinformation issue are the revelations from a recent investigation by Indian news website Cobrapost, in which journalists, posing as Hindu nationalists, offered cash to major media organizations, in exchange for publishing polarising, pro-Hindutva content. The findings of the Cobrapost sting dampens the hopes that eminent outlets, which have garnered the respect and trust of its readership, could play a vital role in curbing India’s descent into a post-truth society. These revelations also coincide with recent figures that suggest public trust in media institutions is waning, an augury inextricably linked to populism’s global surge. While these recent events are troubling, the spread of disinformation online is, at present, a largely new phenomenon in India. Economic growth and an expanding middle class has been accompanied by an estimated 40% increase in the number of internet users across the country. The double-edged sword of such an accomplishment is the potential exploitation of vulnerable citizens, too many of whom possess low levels of media literacy and will undoubtedly struggle with discerning fact from fiction. Furthermore, their subsequent participation in social media will likely lead to the development of their own “echo chambers,” where fervent supporters of a party are increasingly less likely to encounter independent media or opinions that are tangential to their own. The seemingly global pivot from broadcasting to narrowcasting has polarised India’s electorate by encouraging both media organisations and political entities to placate their fringes with content that is fraught with panic and devoid of truth. In doing this, they suppress the notion that moderate, inclusive policy has any role to play in the country’s trajectory. In what was a disastrous first attempt to quell disinformation, the Modi government presented a policy that was appropriately rebuked as illiberal and nebulous. The since retracted proposal sought to revoke the accreditation of any journalist accused of proliferating fake news, with the loss of access commencing after an accusation and prior to an investigation. Implementing such an arbitrary policy in a nation that trails Afghanistan, Guatemala, and the Central African Republic in press freedom rankings would have likely emboldened the BJP to bar non-sycophantic journalists from questioning policymakers and accessing government records. Whereas authoritarian regimes enjoy the advantages of censorship and intimidation of the press, democracies must be willing to make long-term investments in accountability initiatives. The central government would do well in developing cross-partisan support for a third-party factchecker and implementing a media literacy campaign ahead of the 2019 elections. However, such reforms would be feckless if the BJP itself fails to vet the fallacious claims and fictitious stories that are forwarded, shared, retweeted, and otherwise propagated by its own personnel. Furthermore ensuring protections for journalists must remain a priority amid the litany of recent tragedies suffered by media personnel. By equating a vote for Modi as a vote for Hinduism’s preeminence, the BJP risks setting a dangerous precedent for future elections, in which, the rewards of disinformation campaigns become too enticing to pass up. In lieu of meaningful policies that address the woes suffered by all Indians, the BJP has instead opted to play identity politics at its maximal level. In pursuing a stratagem hell-bent in sowing discord, the party hopes to mimic the success of reactionary movements that drove voters to the polls via demagogy. While such a scheme may result in electoral victory, it also portends dangerous ethnic and religious strife within a country whose greatest asset has always been unity.